Much forward progress on my scrap quilt! I finished piecing the top in six only slightly obsessive days, then put it together with the batting and the back. So determined was I to have this be a quilt that ate into my reserves that I pieced all my leftover pieces of batting together, simply laying them down edge to edge until I covered my entire quilt area, and called that a day. I had muslin in the stash for the back. A quick aside to say: Do not be intimidated by quilting! Remember, this is a craft developed by uneducated mountain women who just wanted a warm blanket! You don't have to be perfect and you don't have to follow any rules and you can do it any way you want and call it good enough. 1. Lay out the big muslin square that will become the back, right side down. I pieced together two lengths of muslin and pressed the seam open. Pull out all the creases and possibly weight the corners of the back so it stays flat (I pull a piece of furniture close enough to place a chair leg on the fabric which only works if you're working on the floor, obviously). 2. On top of that, gently place your batting. Purchased in one piece, or, if necessary, laid out in pieces (give them a little overlap, like an inch). Do not pull them around on the muslin, thereby making it bunch up. 3. On top of that, float your quilt top down right side up (help is handy here). Make sure it's lined up correctly, corners square, etc. Give yourself plenty--four to six inches-- of batting and muslin sticking out around the edge. If you need to adjust its position, lift it up and move it--don't drag!! 4. Now, you can pin or baste. Either way, you want to attach all three layers together every six inches or so. You can pin safety pins onto your quilt in row after row, or you can thread a needle with a really long dark thread (or white, if your top is dark), and take big stitches in rows across the top, every six inches. I thread my needle so I can get all the way across the quilt in one thread. For machine quilting, I baste so no pins get tangled up with the machine. 5. It's time to quilt! First turn the quilt over and make sure there aren't any bunched up areas basted into the back. If there are, you have to decide if they're worth picking out and straightening, or if you're going to just charge ahead. 6. To machine quilt, I highly recommend a walking foot. You put it on a regular sewing machine, you sew. Decide you're going to do straight lines. Do it for the sanity. I just quilted mine in diagonals lines, going both directions. Binding still to come, after my shoulders have recovered from the machine quilting. Thank you for sharing this Anna. The actual quilting is intimidating, but you make it sound more do-able. I will be referring to this post when I get around to making my first quilt (I did make a small one for my dog, but that doesn't count as it was very small). Beautiful :) I like the look of scrap quilts so much more than ones composed of specially purchased coordinates. Don't quote me on this but I think using up scraps was the original purpose of quilting. Which of your beautiful girls gets this quilting creation for their room? I just wanted to say thank you for the inspiration! After your post the other day about atarting a scrap quilt, I pulled out my scraps and sorted them by spring and winter colors and started cutting 3" squares. Ah, how fulfilling to see the mess of scraps turned into neat piles of squares! Now your beautiful nearly finished quilt has inspired me to get to sewing them together! "You don't have to be perfect and you don't have to follow any rules and you can do it any way you want and call it good enough." Anna, What size is your quilt and what kind of sewing machine are you using? I pieced a queen size quilt last summer, but there is no way I can get all that fabric under my machine to quilt it. So...its all basted, rolled up & stashed in a closet waiting to be quilted. Had to purchase all the fabric as I didn't have scraps. I too will have to keep that in mind. I always loved my grandmothers quilts and to me they are all perfect. This is the one thing "perfection" that keeps me from attempting any of my own. Nothing better than making something that beautiful from the "scraps" you have in the house!! Thank you for sharing your tips! I have always been one of those people "afraid" to quilt. You may have just given me the courage to try making one.. need to get my scraps together! You are an inspiration! Lovely quilt! I'm fond of the "galloping camel" school of measuring quilt perfection - if you cannot see the "imperfection" from the back of a galloping camel, it's not an imperfection! The hardest part about machine quilting isn't the stitching, it's the rolling the quilt up so you can push it through the machine throat area. I use the walking foot when I'm attaching the binding, as well as for straight line quilting. I saw this pattern and I thought you would love it! Above it the ravelry address, in case your on ravelry.com.I'm prarieladycrft on there. Thanks for tips, Anna - I've noticed how much nicer/prettier they look after the quilting is done. Even the plainest looking bunch of scraps sewn together takes on a whole new appearance after being stitched up. I'm gearing myself up to start on an inexpensive quilt top I got online. What a cheerful quilt, Anna! I've hand quilted several quilts, but I've only machine quilted one -- it definitely takes a toll on the shoulders! 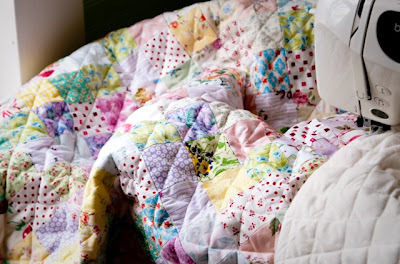 There is nothing cozier than a scrap quilt! Yours is perfect! It's beautiful, Anna!! And thank you so much for sharing those great tips! That is gorgeous! After seeing your first post on your scrap quilt, inspired me to dig through my stash and start cutting 3" squares. =) But now I'm not sure how to piece them. Did you just randomly piece squares together regardless of another of the same fabric being in the same row, or?? Thanks for sharing your tips!! How do you cut your squares? With a ruler, a template, a square? Beautiful. Anna, the quilt is going to be fabulous when finished. I need to eventually quilt all of those squares that I have. It's pretty! It makes me think of when my girls paint in watercolors, and then accidentally spill their water cup all over their new painting - all the colors get all swirly-d together. I like it! THANK YOU, ANNA!! I took a deep breath and started machine quilting today and have been so hard at work, I only now checked your blog. Serendipitous! I so so so appreciate the encouragement you give your readers, reminding us that quilting is very practical. I have read a number of quilting books and they are intimidating. I am a newbie seamstress, but I am making my first quilt! It's twin size, for my daughter, and I used a nine-patch pattern sticking to yellow, pink, and blue, all in soft tones. Then I interspersed big patches from an old sheet and backed it all with another old twin sheet. EASY. I'm doing the exact same quilting pattern you are - so easy because you don't have to draw a pattern or twist the quilt around a lot. I didn't bargain on the sore shoulders - sheesh. But in one afternoon as my kids napped, I have most of the middle quilted! I would say that a walking foot is a necessity. I have a Bernina and their walking foot is over $100, but I found one on ebay for $60 and it has more uses than just quilting. I LOVE talking quilting, so I just rambled on here. Your influence and encouragement is great! 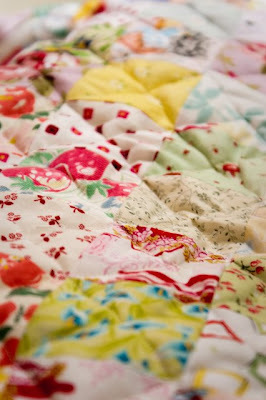 I still just love the fresh spring colours of your scrappy quilt. I've seen a walking foot in action. For a quilt you just want done quick it seems like the must fun toy to attach to the sewing machine! Great inspiration. I would just like to add that when I am piecing the 3 layers together, which I do on the floor, I use masking tape to stretch out the backing and hold firmly in place. I put a piece of masking tape about every 8or 10 inches around the perimeter of the backing and pull it fairly taut so there are no nasty wrinkles in it when I go to sew the whole thing together. I agree that the walking foot is a must for machine quilting. I have done it without and it is much harder to get the fabric to keep moving evenly along and much easier to end up with nasty bunches on the backing. It looks beautiful! Thanks for posting these instructions. Now to work up the courage to begin . . .
Wow, this is sweet! I prefer quilts made from scraps, and I love the diagonal lines. It really adds something to the quilt. Love it! I can feel that I really might could do this-one day-but I have always thrown away left over fabric from my projects. so that makes me sad/mad.. I should have listened to my grandma when she told me to save them for a crazy quilt I would want to make one day. you're very smart so would you tell me how many 3 inch squares it takes to make up a queen size quilt? or even a twin? Beautiful! Maybe one of these days I'll gain the confidence to try a quilt myself. Thanks for sharing! I would love to see a full shot of the quilt! It is beautiful. My favorites are always the ones made from scraps - a true quilt. Terrific job. Ilove the colors.